The #NotAtISTE18 assisted me greatly with experiencing numerous ISTE presentations when I could not attend the conference. One session that intrigued me was Micah Shipee’s “Create Your Own App Using Google Slides.” A link to the presentation can be found here. This concept was a bit mind-blowing to me, yet it completely made sense. 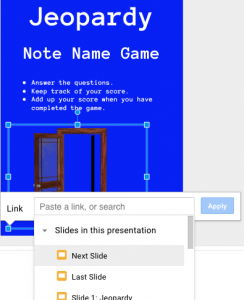 Since Google Slides is a web-based tool that generates its own link, and allows you to link one slide to another slide, then you could create a simple app that serves numerous purposes. In Micah’s presentation, there are three examples listed. One shows how google slides was used to create an app for a school’s calendar and board notes. Another example demonstrated how a classroom teacher used it for scheduling, homework, and more. A third example focused on how students could log summer reading. 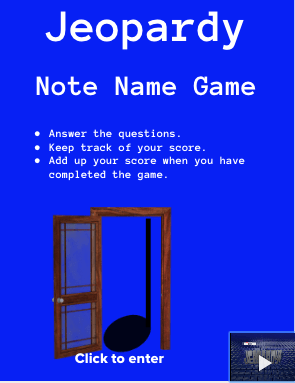 When I sat down to try this, I decided to create an app that would serve as a note naming game. This would be a Jeopardy-type of game where students would practice naming notes. This could also be used as an assessment, though it made more sense for this to be a game or practice. I started with a blank Google Slide Template and looked for a font that would imitate the Jeopardy font and turned the background blue. I added the instructions and made the game a cross-curricular math connection by having the students add up their own scores (see figure 1). 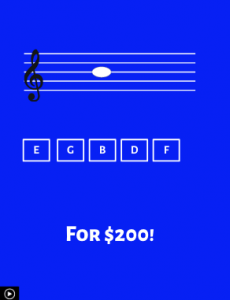 I added a graphic of a quarter note inside a door frame. I clicked on the graphic and then clicked on the “link” icon. This brought up a menu of where to go when the graphic was clicked. I scrolled down to “Next Slide” (see figure 2). 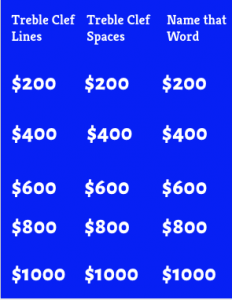 Using text boxes, the “Next Slide” was the Jeopardy board with all of the dollar amounts (see figure 3). I linked each text box to a slide with a question. The question was to name the note name that appeared on the screen. 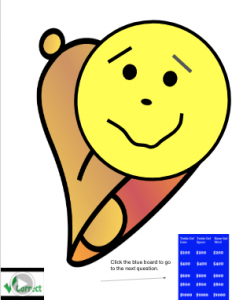 To make the staff and note name, I utilized the line tool (to create a five-line staff), the shape tool (to create a note head), and google images (labeled for reuse) to find the treble clef (see figure 4). The answers were listed in their own individual text boxes. These answer boxes linked to an unhappy smiley face for incorrect answers (see figure 5) or a happy smile face for the correct answer (see figure 6). The final steps were to create a link by using the link sharing tool and changing the permissions to “Anyone with a link”. Finally, from that generated link, change the end of the link, which is “edit#slide=id.p” to “preview”. when clicked. This way, your students begin the game as soon as they click the link. 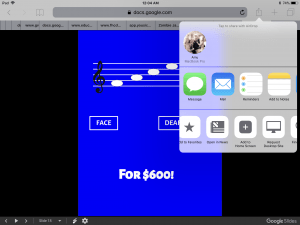 In addition, if they are on an iOS device, this link will open up in Safari and they can click the share button and click on “Add to Home Screen” (see figure 7). This places the app onto their home screen (see figure 8). In order to do this, I tried to embed a sound file. I tried to use the extension AudioPlayer for Slides. There is an older version and a newly updated version. I was not able to make either extension work. I did write the creator and they were very helpful and quick to respond. It could have been that other extensions were preventing this from working properly, but I decided to embed videos and then decrease the size of the videos. This worked successfully and is why you see tiny little video icons in some of the figures listed above. 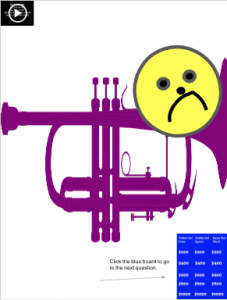 The sound/videos were those of the notes that appeared on the screen (if the note E was on the screen, then the video would play the note E), a few seconds of the Jeopardy theme, a “correct” bell, and an unhappy “incorrect” trumpet “wah”. Google Slides makes it intuitive to add a video url and to format the video so that it plays only a short portion of the video and so that it automatically plays when it is in presentation mode. I experienced some personal snags with the sound. When I shared the preview link to an iOS device, the app opened up and worked well, but the videos would not play in Safari. If you opened the link in Chrome, the app worked well and the videos would play, but you would have to press the play button. The videos would only automatically play when you were in Google Slides in the presentation mode. This has a lot of potential. I could make a practice app for students to use with their iPads or chromebooks. There is also a lot of potential to have older students create the app using Google Slides for my younger students to play. The latter is one I hope to explore this school year. This would be wonderful for my older students as they would be utilizing musical skills and empathy to create an app for younger students. 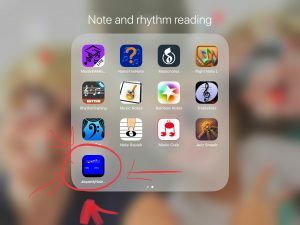 My younger students would be using the app to practice their own musical skills. I really liked this idea and thank Micah for sharing this with the #NotAtISTE18 audience.